Nope. I went to Milwaukee last weekend to see some friends, hit two baseball games, abuse my body, do some tailgating and make the holy pilgrimage to Lambeau Field. Call it an old-school male bonding weekend, the kind of thing guys did before Vegas became popular. I even kept a running mega-diary. Here’s what transpired. 6:00 p.m. — My buddies Chip (Milwaukee native, serial babbler, host for the weekend), JackO (Hartford resident, Yankee fan, raconteur) and Gallo (San Fran resident, Vikings fan, Lambeau admirer) pick me up at the airport. First stop: Miller Park. As a monkey wrench, Chip is driving us with a broken right ankle suffered during a softball slide gone horribly wrong. Now we’re trying to decide what we’re more excited about tonight — the sausage race, or Chip having a few beers, then spilling down an aisle on his crutches. Frankly, it’s a toss-up. 6:45 — Gallo toasts Chip for remembering to bring a cooler of ice-cold beer for the 40th time. The number of Brewers fans tailgating is staggering — it feels like a football game. Can you blame them? Who doesn’t love tailgating? 7:15 — We’re headed to our seats one inning late … but not before ordering the first round of brats. Love the prices: $5 for a beer, $4 for a brat, $2.75 for a hot dog. JackO eagerly orders the “cheese fries in a [mini-Brewers] helmet,” vowing, “I’m just using the helmet as my plate all weekend. Every time we eat anything, I’m eating it out of the helmet.” I think he’s serious. 7:24 — Guy on third, two outs, grounder back to the mound … and Tomo Ohka chases the runner back to third, quickly realizes how moronic this is, then whips the throw 10 feet over his first baseman’s head. We’re tied at one. Ladies and gentleman, Quadruple-A baseball! That leads to a spin-off discussion: What in God’s name makes Damon so great to have in the clubhouse? Does he walk around telling knock-knock jokes and handing out mix tapes to his teammates? Does he organize the bachelor parties and bring in homemade chocolate chip cookies on Sundays? When A-Rod is down in the dumps, does he crack him up with his imitation of Jame Gumb’s tuck dance? And if he’s that great for everyone, why doesn’t he host a daytime talk show or something? 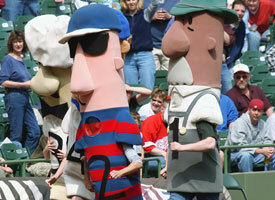 7:44 — We’re so titillated thinking about the Sausage Race (still three innings away), we decide to wager on it. I claim the Italian first, followed by Geoff picking the Polish, JackO the brat and Chipper the hot dog. Five bucks apiece, $20 to the winner. Although we’re all winners, really. 7:48 — Not to sound like legendary Hollywood producer Bob Ryan, but what if I told you that Gabe Gross uses a Christian song for his at-bat music that includes lyrics like “help me Jesus!” and “Hallelujah!” Is that something you’d be interested in? 8:03 — Just noticed Dale Sveum is coaching third for the Brewers. I will now try to suffocate myself with a helmet of cheese fries. 8:09 — Milwaukee’s Billy Hall ties the game with a homer, followed by Bernie Brewer sliding down his slide in right field and landing, feet first, on a catwalk. Wait, why didn’t he land in the mug of beer? Chip informs us that they jettisoned the mug a few years ago for PC reasons. You know, because Bernie Brewer landing in a mug of beer was causing the teen drinking rate in Wisconsin to skyrocket. I’m beginning to hate living in this country. 8:12 — Biggest disappointment of the weekend: Brewers rookie Corey Hart not using “Sunglasses at Night” as his at-bat entrance music. That hurts. He ends up crushing a ball toward the wall that brings the crowd to life — as well as JackO, who starts screaming, “Never surrender! Never surrender!” — before it dies at the warning track as the crowd groans. On the bright side, that leads to five minutes of, “Now batting, the shortstop, Colin Hay” jokes. 8:16 — A spirited discussion: How many guys in this game could have started for the Yanks and Red Sox? Definitely Lance Berkman and … yeah. That’s the list. 8:20 — Just ran up to get another brat. John Hollinger has me on pace for 19 brats per 48 minutes right now. Hey, you know those T-shirt jerseys that every team sells? Only three are available at the concession stand behind Section 119: J.J. Hardy (out for the year), Derrick Turnbow (lost his closer’s job two months ago) and Carlos Lee (traded to Texas three weeks ago). They don’t kid around with this “small market team” stuff, folks. 8:25 — Chip points out the gigantic Pepsi sign in center field that Sammy Sosa struck during the 2002 Home Run Derby. It’s about 600 feet away. We were both there that night. I kinda miss the days when someone could belt a 600-foot homer and nobody in the park would think it seems fishy at all. Simpler times, you know? 8:45 — Time for the Sausage Race! You can feel the electricity — it’s like those last few moments before the Kentucky Derby gun. The Italian quickly breaks out to a big lead, scurries away from the pack and wins by five lengths as I’m screaming like Jeff Bridges at the end of “Seabiscuit.” Twenty bucks, baby! That’s the Italian’s 22nd win of the season, nine more than the second highest sausage. JackO quickly wonders if they need to start drug-testing the special sauce. 8:54 — Did I mention that the 7-8-9 batters for Houston tonight are Adam Everett (hitting .239), Eric Munson (.207) and Brandon Backe (.139)? Let’s just legalize performance-enhancing drugs in the National League. It’s time. 9:03 — Starting a “What would you use as your at-bat music?” discussion, JackO picks U2’s “Unforgettable Fire.” Chip goes with “Take Me Out” by Franz Ferdinand — the second part of the song, not the first part. Gallo picks the instrumental song from “Halloween” when Laurie walks across the street near the end of the movie right before she finds out that Michael Myers killed her friends. As for me, The Who’s “Eminence Front” has always been enticing, but that’s more of a closer’s song … so I’m going with “Hate It or Love It” by The Game. I’d want to be the first white baseball player who crosses the at-bat music racial barrier. Like the Reverse Jackie Robinson. 9:05 — Reason No. 792 to love Milwaukee: During the seventh-inning stretch, cheerleaders dance to polka songs on top of the Brewers dugout. They’re like the Bizarro Laker Girls. 9:20 — I’m downing another brat. Why? Well … why not? I’m still one of the 10 skinniest people in Miller Park right now. By the way, we’ve already had two gift shop purchases: A blue hat with the current “M” logo for Gallo, as well as a throwback yellow-and-blue Brewers hat for JackO. Did you know that the baseball glove on the old Brewers hat was really an “m” resting on top of a lower-case “b”? Everyone’s incredulous that I didn’t know that. Come on, I’m the same person who was shocked when George Michael came out. 9:24 — JackO takes some sports bigamy heat for purchasing the Brewers hat. “There’s no sports bigamy potential,” he argues. “When will the Brewers and Yankees play in a World Series? Come on. That’s never happening!” Almost on cue, the dude in front of us wearing the Yount throwback jersey turns around and nods glumly. 9:45 — This seems like a good time to mention that (A) this place is almost sold out tonight, (B) it’s the bottom of the ninth, (C) nobody has left yet and (D) Brewers fans are like over-supportive Little League parents. It’s an old-school baseball crowd, like those super-supportive WWF crowds from the ’70s. Anyway, bases loaded, one out, potential franchise player Prince Fielder at the plate … and he comes through with a single as the park explodes! Brewers win! They’re four games out of the wild-card. Fielder gets mobbed by teammates at first base as JackO jokes, “I can’t wait to watch him playing for the Yanks in five years.” Actually, that wasn’t a joke. 10:15 — More tailgating as we wait out the postgame traffic. Did we ever figure out who came up with the idea to tailgate at sporting events? Seriously, there had to have been one guy in the ’40s or ’50s who said to his buddies, “Hey, what if we show up early for the game, park the car, bring an Igloo of beer, and we’ll just hang out in the parking lot, listen to music and make fun of each other until the game starts?” And everyone else was, like, “Wait, that’s a great idea! That might work!” Shouldn’t this person be identified and properly deified? He’s the Jonas Salk of drinking in public, right? 11:15 — We head downtown for beers at Mo’s Pub. Unfortunately, they’re showing baseball highlights and … well … even I’m willing to concede that Derek Jeter might be the MVP this season. He’s the undisputed leader of the Yankees, A-Rod’s on-field shrink, the guy every Yanks fan wants up there in a big spot, and if that’s not enough, he’s hitting .341 and gets to tell Nick Lachey, “sloppy seconds.” Impressive résumé. 11:16 — Scratch that, I’m just buzzed. Don’t listen to me. 11:45 — You know, going to Milwaukee is almost like climbing in a time machine. It’s OK to eat bad food and drink heavy beer. It’s OK to smoke inside bars and restaurants. It’s OK to make small talk and smile at complete strangers. All we’re missing is an NBA star causing an HIV scare and it would be 1992 all over again. Screw it, let’s play Soundgarden on the jukebox and turn off the condom machine. Nobody’s getting laid tonight, folks. Nobody! 12:45 a.m. — We make the obligatory five-minute ride to Potawatomi, the local casino in town. That’s right, casino. You heard me. Casino. Cah-see-no. And you had the gall to question me on this Milwaukee thing? 2:00 — After some moderate losing in craps, someone throws out the “Is anyone hungry?” bait. Within five minutes, we’re sitting down at the casino’s sports bar, watching USA-Japan and ordering drinks and food. Our waitress (not svelte) can’t vouch for the quality of the chowder because, “I’ve had just about everything on the menu, but I’ve never tried that,” which is loosely translated in restaurant-speak to mean, “By all means, don’t order the clam chowder, you will be crapping for the rest of the weekend.” Somehow, this leads to us ordering four bowls, as well as four pulled pork sandwiches. We’re on a collective death wish at this point. Nothing can stop us. 2:35 — Should we get colonics tomorrow morning? Nahhhh. 3:15 — We’re all treading water at a $15 blackjack table. If the dealers in Vegas are like Mariano Rivera, then our current dealer is more like Vicente Padilla — hot-headed, erratic, not that effective, not a closer, but you definitely don’t want to lean in against her. She might be the least friendly person in Milwaukee. By a landslide. At least she’s busting occasionally. 3:45 — We touch up Vicente for a few winning hands before making the “We need to leave now or we’re compromising the pilgrimage tomorrow” call. Time to go. 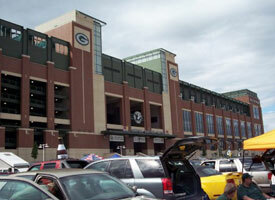 Lambeau beckons. 10:45 — Slowly starting to feel human again, although I might need a C-section. 11:45 — Somehow we’re showered and ready to roll. Chip picks us up in his minivan. And why? Because that’s how we roll, beyotch. JackO and I are delighted by something that happened in the Hyatt elevator: We were headed to the lobby with a guy in his 20s, as well as the guy’s parents, when the guy’s cell phone rang. He quickly answered it in a heavy Wisconsin accent (“Hah-low?”), had a brief conversation with someone and hung up. And that led to one of those monotone exchanges that can only happen in Milwaukee. Now we’re trying to figure out who’s less excited: Everyone in the elevator, or Brian Logan driving to meet everyone in the elevator. Probably a toss-up. 12:00 p.m. — During a stop for coffee, I order one of those pre-made yogurt/granola cups to incorporate a healthy moment into the weekend. “Why even bother?” Gallo wonders. Good point. I order a sourdough coffee cake muffin as well. Who am I kidding? 12:30 — Chip gives us a brief driving tour of Milwaukee and the surrounding villages, babbling the entire way as we take turns busting his chops and making fun of the fact that only 9-10 people were running along Lake Michigan on a sunny summer afternoon. Remember the scene in “Airplane” when Ted Striker is telling various passengers about World War II, and they would come back from the flashback and they’d either be hanging or pouring gasoline on themselves? That’s how Chip gets when Milwaukee’s involved. Sadly, I’m forced to plug in my iPod to his car radio and crank Bloc Party at 70 decibels to fend him off. 12:40 — We’re on the road! Two hours until we hit Green Bay. Vegas just listed the over/under for farts on this ride is “139.5.” Take the over. 1:00 — The running Brian Logan joke has evolved to the point that we’re now pretending that (A) he’s meeting us at Lambeau, and (B) it will be the first time we’ve seen him since the funeral for his father, Brian Logan Sr. Who imagined that a Hyatt elevator could bring four guys so much joy? 1:15 — Just a beautiful drive: No hills, farmland on both sides, sun shining up above. Feels like being in one of the cars at the end of “Field of Dreams.” It’s legitimately a pilgrimage. There’s no other word that fits. “This is great,” Gallo keeps saying. He’s beaming from ear to ear. If the NFC Central was Scientology, he’d be Tom Cruise. 1:30 — We’ve passed at least 10 signs for cheese-related stores or foods so far. You have to hand it to Wisconsin: The people here have listened to every health-related study from the past 25 years — watch out for fried foods, butter and cheese, beware of heavy beer, make sure you eat enough vegetables and fruit, try to exercise as much as possible — and basically said, “You know what? If it ain’t broke, don’t fix it.” I love Wisconsin. 2:10 — We were a little worried about rain today, but we just passed a herd of cows, all of whom were standing. According to Chip, if cows are lying down, that means rain is coming. If they’re standing, you’re OK. These are the things you learn in Wisconsin. Twenty-five miles to go. 2:35 — After working the iPod (plugged into the car radio) like a champ for close to two hours, I finally make a mistake: Playing a rap song right as we pass one of those “NOW ENTERING GREEN BAY” signs. That’s just wrong. Three miles to go. 2:40 — Now we’re giddy. Just got off at Exit 32 (Oneida Street) and we’re working our way through downtown Green Bay. During our ’93 pilgrimage (just Gallo, Chip and I that time), we got lost near Lambeau and asked for directions, followed by a local telling us, “See that K-Mart over there? Drive up to that, take a right and you’ll see the stadium.” He wasn’t kidding, either. I loved that moment. Unfortunately, they’ve since built up the area with the usual suspects (Best Buy, Barnes and Noble, Target, etc.) and more restaurants (including an I-Hop, which Gallo calls it “the Whole Foods of Green Bay”). But the stadium still stands out on first glimpse. Imagine driving through a small town where you live, then stumbling across a state-of-the-art, 60,000-seat high school stadium. That’s what it’s like.